Three-in-ten adult social media users have at least one of their accounts currently set up to automatically “tag” their posts with their current location, up from 14% two years ago who had ever done this, according to a May Pew Research Center survey. Such “location-tagging” was more common among younger social media users, the survey found. About a third of users aged 18-49 said they’d set up their social-media accounts to location-tag their posts, compared with 26% of 50-to-64-year-olds and just 18% of users aged 65 or older. While location-tagging has grown more popular over the past two years, another location-based practice — “checking in” via a geosocial service such as Foursquare — seems to have become less so. The May survey found that 12% of adult smartphone owners (equivalent to 7% of all adults) had used a check-in service , down from 18% (10% of all adults) in February 2012. 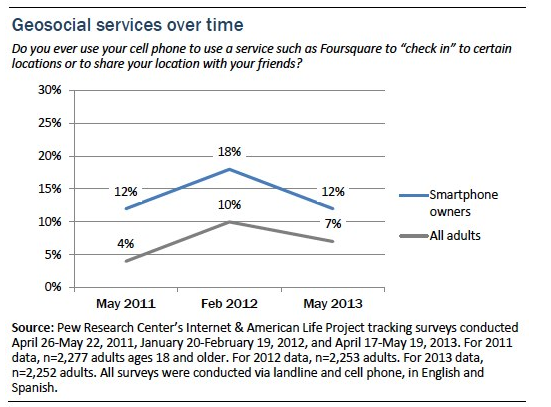 As researcher Kathryn Zickuhr noted in the report, the line between social-media services and location-based services is blurring, as “social media services incorporate location as an element of user activity and as location-centric services embrace varying degrees of social functionality.” Indeed, when we asked users of check-in services which ones they used, a plurality (39%) said Facebook; runner-up Foursquare was mentioned by only 18%, while 14% cited Google Plus.